← The U.S. should not be threatened by China but could it be ignored? I’ve been going to Las Vegas for more than forty years (my sister and I went so many times before I was eighteen we knew the Sands hotel very well). I am not much of a gambler but I do play a little from time to time and like casinos and the vibe of Las Vegas for a few days every few years. So when I planned my trip to Hong Kong and then Shenzhen I asked my friend Tom if we could make a trip over to Macau. He readily agreed and had been there a couple of times himself. We took the high speed catamaran-ferry (about a one hour ride) from Hong Kong to Macau on Saturday. I was very interested to see Macau for myself. 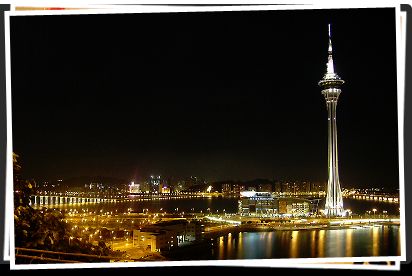 Now a Special Administrative Region (SAR), Macau was administered by Portugal for 442 years until it was handed back to China in 1999. There has been some casino gaming going on in Macau for many years but over the past ten years giant, ornate casinos have sprung up in Macau. In fact the Wynn hotel in Macau generates 65% of the total profits for Wynn Gaming. There’s an MGM Grand Hotel and other familiar names like The Venetian (run by Las Vegas Sands) and the Four Seasons. We went to the Venetian because there was an air-conditioned bus was right off the ferry landing and it was hot and free. I’ve been to the Venetian in Las Vegas so I was eager to see how much the concept was copied. The answer was – a lot. The casino floor is a big giant room, in fact the largest casino room I’ve ever been in and Foxwoods in Connecticut had a very large room when it opened but I believe they have parceled that room into smaller rooms now. The shops and canals and restaurants were reminiscent of the Las Vegas version. But it was immediately noticeable that there were more than a few things missing in the overall casino experience. First the room lacked energy and sound. There were no slot machines ringing, no music playing and the people at the tables seemed bored. Perhaps it was a bit because it was 3PM on a Saturday afternoon but I think that’s the way the Chinese roll in Macau. No free drinks at the tables as the cocktail waitresses (dressed in the Vegas style short skirts) served up bottles of water. The restaurants in the hotel were good and relatively inexpensive. The stores were expensive just like in the Venetian in Las Vegas but they were not crowded. The overriding sense I had was that the people were not having all that much fun. This may be what the Chinese government wants although Macau is still very profitable however maybe China does not need the money as much as it used to? They have shows in the casinos and apparently Lady Gaga recently performed there. But what I really found interesting was that during Chinese New Year (normally February) the Chinese hop on planes in droves and head to Las Vegas (which is great for Las Vegas since it’s a normally slow time of year and it’s been a long hard recession that Vegas has suffered). Apparently Chinese people do notice that lack of energy and that something is not quite the same in Macau. I am glad that I went and saw it for myself but have no real need or desire to go back. There are some remnants of Portugal’s influence around but not enough to make it more of a destination. A watered down Las Vegas just doesn’t have that much appeal to me. I bet you would feel the same. This entry was posted in Best business practices, Business in China, Entertainment and tagged Casinos in China, Lady Gaga, Las Vegas, Macau Casinos, Macau Portugal, MGM Grand, Venetian Hotel, Wynn Hotel. Bookmark the permalink.